It was founded in 2001. Its main aim is spiritual-moral bringing-up students and RK history and culture knowledge propaganda and realization of Honour Codex of a KazNMU student. There are presentations, excursions, scientific- practical seminars, lectures, conferences, “round- tables”, meetings with public figures of culture, science, representatives of social organizations, veterans of war and labour at the museum. Movies (over 30 films), thematic video-films (over 20 themes), expositions, posters are demonstrated. “World’s masterpieces” cinema lectorium is opened. 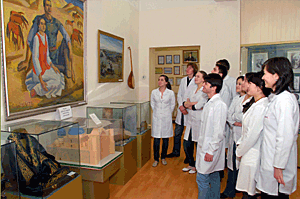 Expositions of the museum represent the main stages of ancient medieval medicine, medical legacy of Al- Farabi, Kazakh national medicine, state medicine, public health of Kazakhstan, historical facts of the thirtieths’ repressions, war years medicine. The whole chapters are devoted to medical workers of the university, participants of the Great Patriotic War (1941-1945), 65 years Great Victory, Manshuk Mametova, Vladimir Ivanilov -Heroes of the Sovet Union, pride of the university, medical workers-Panfilovs. The museum stores original unique things as monuments of Kazakh people’s historical and spiritual culture.